It’s the time of year where I live when fresh produce is plentiful. I’m so grateful for the local farmers who grow my food with much care and love. Most of the ingredients I used in this smoothie are local and organic, just the way I like it. Basil is one of the herbs I find myself adding to more and more smoothies because of the sweet, but savory flavor it lends. I’m also quite fond of its health benefits, which include anti-inflammatory and anti-bacterial properties, antioxidants, and cardiovascular support. 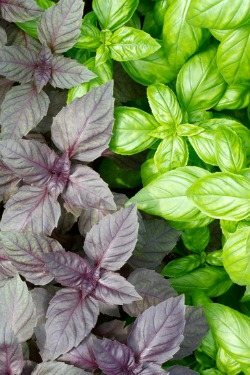 Basil is rich in vitamin K – just two teaspoons provide about 60% of your daily needs. Vitamin K is vital in building strong bones, supports a healthy heart, and contributes to proper brain function. Regardless of the type of berries you choose for this recipe you’re going to get more antioxidants, vitamins, and minerals. Combined with the other ingredients and you’ve got a signature healthy green smoothie. If you haven’t noticed, I’ve been including coconut oil in many of my smoothie recipes lately. I think it’s important to get a healthy fat into the mix for a variety of reasons. In case you’re wondering, I used frozen local organic blueberries and purple basil. Enjoy! I’d love to know if you tried this berry basil smoothie – please do tell in the comments below. Happy Blending! I’m drinking it as I write this – wonderfully refreshing and a great afternoon snack. Love it, thanks a lot for sharing! I have been making this smoothie almost everyday for a couple of weeks now. My day is not complete without it. The basil makes it so refreshing and the cinnamon adds a yummy subtle bonus. Everybody must try!!!! Alright…… So I saw the comments and Kari stated that he has made it for a couple of weeks now… My question is, isn’t this smoothie quite expensive? I mean 70grams of spinach organic wise cost me about 2,5 dollars and for one ingredient every morning is expensive…. Basically I would spend about 15 dollars on just my smoothie, are you crazy or just upper class? So my next question will be, is there any different if I buy it frozen? I’ve never actually calculated the price of a smoothie. This appears to be on the higher end. Although prices vary considerably depending on where you source your ingredients (grocery store, farmers market, garden) and where in the world you live. I advocate local produce when possible, which is generally cheaper. Making smoothies at home is almost always cheaper than buying at the store and most folks (at least in the US) are not upper class. Frozen is just as good and often stays fresher longer.